NORTH ANDOVER, Mass. - The Merrimack College women's ice hockey program utilized a multi-goal performance from senior Katelyn Rae to upend Maine inside Lawler Rink Friday afternoon, 3-0. The team's sixth shutout of the season helped solidify its spot in fifth place in Hockey East standings, just one point behind Boston University with 19 and three points behind third-place Providence. The Warriors were led offensively for the second straight game by Rae, whose two goals on the evening helped cement Merrimack's fifth program win against the Black Bears. After a scoreless first period, the senior stepped up in a big way, giving the Warriors a much-needed goal during its third power play of the afternoon. Her fifth goal in two games doubled as her second short-handed goal of the season after intercepting a pass through the neutral zone and walking in alone on Maine goaltender Carly Jackson. Every big win for the Warriors has had a dominant performance from senior goaltender Samantha Ridgewell; Friday afternoon wasn't any different. Her 30-save shutout was her sixth of the season, and helped the Warriors improve to 9-7-1 in Hockey East play. Goal #1 (1-0 MC) - Katelyn Rae knotted last Saturday's game against Vermont three times on her own, and picked up right where she left off against Maine. During a five-on-three, senior Emily Volpe fired off a shot that was blocked away; getting her own rebound, she found a wide open Rae on the far side post to make it 1-0. Goal #2 (2-0 MC) - Rae scored her fifth straight goal in two games with an absolutely beautiful short-handed finish. 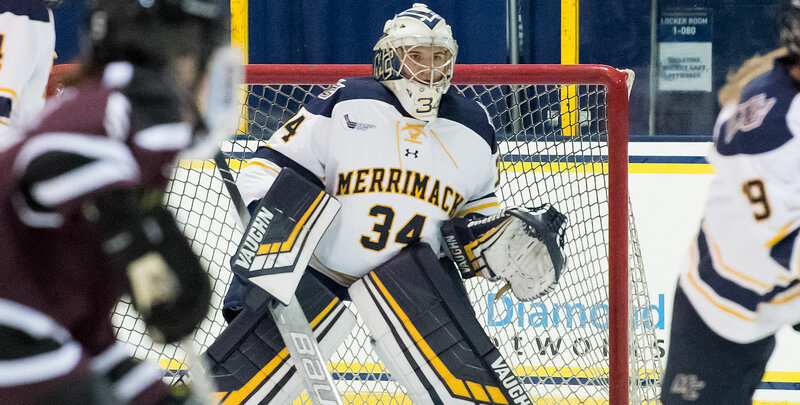 The senior was able to pick off a pass through the neutral zone and walk in on Maine goaltender Carly Jackson before going slipping it past the outstretched blocker to double the Merrimack lead. Goal #3 (3-0 MC) - The Warriors iced the game with 40 seconds left in the third; Bonfe hit an empty-netter to finalize the scoring at 3-0. - The Warriors are tied for first in the nation with four team short-handed goals. - In its last three games, the Warriors have six special teams goals. - Rae is now second in the country in goals scored with 19. The Warriors will finish off its season series with Maine Saturday afternoon; puck drop inside Lawler Rink is set for 2:05 p.m.